Bah, these games are always rigged! To the person who wrote: "umm pay wat 100yen per game or watever" You do know that 100 yen is about 1.07 dollars, right? So 300 yen would be 3.20 or so. If you can get me a lobster for $3.20 USD, then go ahead. That'd be awesome. (Though the 200 in the background is making me think 200 yen a play.) Secondly, wtf about suffocating? Are you stupid? Lobsters can breathe in water or out; look it up. How do you think people buy them from grocery stores, still alive, and bring them home to cook them? Lastly, pretty sure their claws are rubber banded. So I'd play. And some people are good enough at these that they can win within five times. Then you'd definitely save some money. 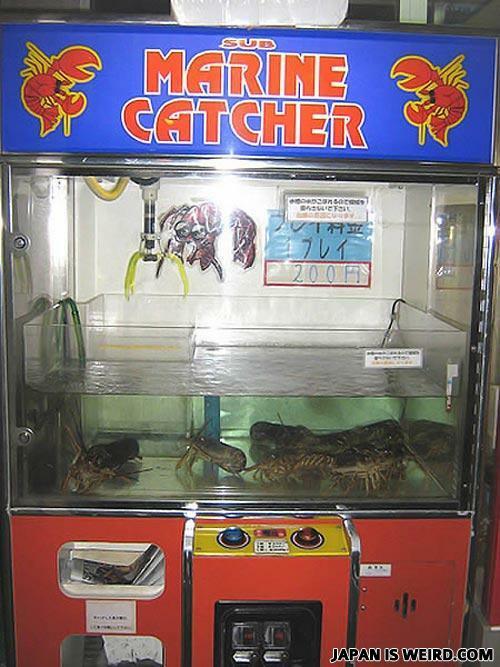 You catch them using a mechanical pincer... That's quite ironic, actually. "mommy i want a soft toy to take home"
Isn't there one in Las Vegas? Your money or your finger? Take your pick. We have one of those machinenes where I live.It cost $5.00 per play.I win almost everytime. Dumbass. There's no rednecks in Louisiana. They're called "Cajuns" and "Creoles". Theres probably warning waivers in them. You stick your hand in there, and YOU'LL be missing the finger. wow i want the red one!!! Mommy, Mommy! I want one! You couldn't pick up a feather with those weak claws. You might as well climb inside or break the glass.